Encyclopedias have existed for around 2,000 years; the oldest still in existence, Naturalis Historia, was written in ca. AD 77 by Pliny the Elder. The modern encyclopedia evolved out of dictionaries around the 17th century. Historically, some encyclopedias were contained in one volume, but some, such as the Encyclopædia Britannica or the world's largest Enciclopedia universal ilustrada europeo-americana, became huge multi-volume works. Some modern encyclopedias, such as Wikipedia, are electronic and are often freely available. The word encyclopedia comes from the Koine Greek ἐγκύκλιος παιδεία, transliterated enkyklios paideia, meaning "general education": enkyklios (ἐγκύκλιος), meaning "circular, recurrent, required regularly, general" + paideia (παιδεία), meaning "education, rearing of a child"; it was reduced to a single word due to an error by copyists of Latin manuscripts. Together, the phrase literally translates as "complete instruction" or "complete knowledge". One of the earliest encyclopedic works to have survived to modern times is the Naturalis Historia of Pliny the Elder, a Roman statesman living in the 1st century AD. He compiled a work of 37 chapters covering natural history, art and architecture, medicine, geography, geology and all aspects of the world around him. He stated in the preface that he had compiled 20,000 facts from 2000 different works by 200 authors, and added many others from his own experience. The work was published circa AD 77-79, although he probably never finished proofing the work before his death in the eruption of Vesuvius in 79 AD. My subject is a barren one – the world of nature, or in other words life; and that subject in its least elevated department, and employing either rustic terms or foreign, many barbarian words that actually have to be introduced with an apology. Moreover, the path is not a beaten highway of authorship, nor one in which the mind is eager to range: there is not one of us who has made the same venture, nor yet one Greek who has tackled single-handed all departments of the subject. It is a difficult task to give novelty to what is old, authority to what is new, brilliance to the common-place, light to the obscure, attraction to the stale, credibility to the doubtful, but nature to all things and all her properties to nature. Although there were earlier works of a similar nature, by Marcus Terentius Varro for example, Pliny's was the only one to survive the Dark Ages. It became very popular in the Roman world, and survived, with many copies being made and distributed in the western world. It was one of the first classical manuscripts to be printed in 1470, and has remained popular ever since as a source of information on the Roman world, and especially Roman art, Roman technology and Roman engineering. It is also a recognised source for medicine, art, mineralogy, zoology, botany, geology and many other topics not discussed by other classical authors. Among many interesting entries are those for the elephant and the murex snail, the much sought-after source of Tyrian purple dye. Although his work has been criticized for the lack of candor in checking the "facts", some of his text has been confirmed by recent research, like the spectacular remains of Roman gold mines in Spain, especially at Las Medulas, which Pliny probably saw in operation while a Procurator there a few years before he compiled the encyclopedia. Although many of the mining methods are now redundant, such as hushing and fire-setting, it is Pliny who recorded them for posterity, so helping us understand their importance in a modern context. Pliny makes clear in the preface to the work that he had checked his facts by reading and comparing the works of others, as well as referring to them by name. Many such books are now lost works and remembered only by his references, much like the lost sources mentioned in the work of Vitruvius a century earlier. The work De nuptiis Mercurii et Philologiae ("The wedding of Mercury and Philologia") written by Martianus Capella (4th-5th century) was very influential on the successive medieval encyclopedias. It consists in a complete encyclopedia of classical erudition. It firstly introduced the division and classification of the seven liberal arts (trivium and quadrivium), followed by many successive works along the Middle Ages. The first Christian encyclopedia were the Institutiones divinarum et saecularium litterarum of Cassiodorus (543-560), which were divided in two parts: the first one dealt with Christian Divinity; the second one described the seven liberal arts. Saint Isidore of Seville, one of the greatest scholars of the early Middle Ages, is widely recognized as being the author of the first known encyclopedia of the Middle Ages, the Etymologiae or Origines (around 630), in which he compiled a sizable portion of the learning available at his time, both ancient and modern. The encyclopedia has 448 chapters in 20 volumes, and is valuable because of the quotes and fragments of texts by other authors that would have been lost had they not been collected by Saint Isidore. The most popular enciyclopedia of Carolingian Age was the De universo or De rerum naturis by Rabanus Maurus, written about 830, which was based on Etymologiae. The most widely diffused encyclopedia at the beginning of High Middle Ages was the Didascalicon of Hugh of Saint Victor. Bartholomeus Anglicus' De proprietatibus rerum (1240) was the most widely read and quoted encyclopedia in the High Middle Ages while Vincent of Beauvais's Speculum Majus (1260) was the most ambitious encyclopedia in the late-medieval period at over 3 million words. Byzantine encyclopedias were compendia of informations about both Ancient and Byzantine Greece. The first of them was the Bibliotheca written by the patriarch Photius (9th century). The Suda or Souda (Greek: Σοῦδα) is a massive 10th century Byzantine encyclopedia of the ancient Mediterranean world, formerly attributed to an author called Suidas. It is an encyclopedic lexicon, written in Greek, with 30,000 entries, many drawing from ancient sources that have since been lost, and often derived from medieval Christian compilers. The early Muslim compilations of knowledge in the Middle Ages included many comprehensive works, and much development of what we now call scientific method, historical method, and citation. About year 960, the Brethren of Purity of Basra were engaged in their Encyclopedia of the Brethren of Purity. Notable works include Abu Bakr al-Razi's encyclopedia of science, the Mutazilite Al-Kindi's prolific output of 270 books, and Ibn Sina's medical encyclopedia, which was a standard reference work for centuries. Also notable are works of universal history (or sociology) from Asharites, al-Tabri, al-Masudi, Tabari's History of the Prophets and Kings, Ibn Rustah, al-Athir, and Ibn Khaldun, whose Muqadimmah contains cautions regarding trust in written records that remain wholly applicable today. These scholars had an incalculable influence on methods of research and editing, due in part to the Islamic practice of isnad which emphasized fidelity to written record, checking sources, and skeptical inquiry. The enormous encyclopedic work in China of the Four Great Books of Song, compiled by the 11th century during the early Song Dynasty (960–1279), was a massive literary undertaking for the time. The last encyclopedia of the four, the Prime Tortoise of the Record Bureau, amounted to 9.4 million Chinese characters in 1,000 written volumes. There were many great encyclopedists throughout Chinese history, including the scientist and statesman Shen Kuo (1031–1095) with his Dream Pool Essays of 1088, the statesman, inventor, and agronomist Wang Zhen (active 1290–1333) with his Nong Shu of 1313, and the written Tiangong Kaiwu of Song Yingxing (1587–1666), the latter of whom was termed the "Diderot of China" by British historian Joseph Needham. The Chinese emperor Yongle of the Ming Dynasty oversaw the compilation of the Yongle Encyclopedia, one of the largest encyclopedias in history, which was completed in 1408 and comprised over 370 million Chinese characters in 11,000 handwritten volumes, of which only about 400 remain today. In the succeeding dynasty, emperor Qianlong of the Qing Dynasty personally composed 40,000 poems as part of a 4.7 million page library in 4 divisions, including thousands of essays, called the Siku Quanshu which is probably the largest collection of books in the world. It is instructive to compare his title for this knowledge, Watching the waves in a Sacred Sea to a Western-style title for all knowledge. Encyclopedic works, both in imitation of Chinese encyclopedias and as independent works of their own origin, have been known to exist in Japan since the 9th century CE. These works were all hand copied and thus rarely available, beyond wealthy patrons or monastic men of learning: they were expensive, and usually written for those extending knowledge rather than those using it. During Renaissance the invention of printing allowed a wider diffusion of encyclopedias and every scholar could have its own copy. The De expetendis et fugiendis rebus by Giorgio Valla was posthumously printed in 1501 by Aldo Manuzio in Venice. This work followed the traditional scheme of liberal arts. However, Valla added the translation of ancient Greek works on mathematics (firstly by Archimedes), newly discovered and translated. The Margarita Philosophica by Gregor Reisch, printed in1503, was a complete encyclopedia explaining the seven liberal arts. The beginnings of the modern idea of the general-purpose, widely distributed printed encyclopedia precede the 18th century encyclopedists. However, Chambers' Cyclopaedia, or Universal Dictionary of Arts and Sciences (1728), and the Encyclopédie of Diderot and D'Alembert (1751 onwards), as well as Encyclopædia Britannica and the Conversations-Lexikon, were the first to realize the form we would recognize today, with a comprehensive scope of topics, discussed in depth and organized in an accessible, systematic method. Chambers, in 1728, followed the earlier lead of John Harris's Lexicon Technicum of 1704 and later editions (see also below); this work was by its title and content "A Universal English Dictionary of Arts and Sciences: Explaining not only the Terms of Art, but the Arts Themselves". Much encyclopaedism of the French Renaissance was based upon the notion of not including every fact known to humans, but only that knowledge that was necessary, where necessity was judged by a wide variety of criteria, leading to works of greatly varying sizes. Béroalde de Verville laid the foundation for his encyclopaedic works in a hexameral poem entitled Les cognoissances nécessaires for example. Often, the criteria had moral bases, such as in the case of Pierre de La Primaudaye's L'Académie française and Guillaume Telin's Bref sommaire des sept vertus &c.. Encyclopaedists encountered several problems with this approach, including how to decide what to omit as unnecessary, how to structure knowledge that resisted structure (often simply as a consequence of the sheer amount of material that deserved inclusion), and how to cope with the influx of newly discovered knowledge and the effects that it had on prior structures. The term encyclopaedia was coined by 15th century humanists who misread copies of their texts of Pliny and Quintilian, and combined the two Greek words "enkyklios paideia" into one word. The phrase enkyklios paideia (ἐγκύκλιος παιδεία) was used by Plutarch and the Latin rinascimental word Enciclopedia came from him. The English physician and philosopher, Sir Thomas Browne, specifically employed the word encyclopaedia for the first time in English as early as 1646 in the preface to the reader to describe his Pseudodoxia Epidemica or Vulgar Errors, a series of refutations of common errors of his age. Browne structured his encyclopaedia upon the time-honoured schemata of the Renaissance, the so-called 'scale of creation' which ascends a hierarchical ladder via the mineral, vegetable, animal, human, planetary and cosmological worlds. Browne's compendium went through no less than five editions, each revised and augmented, the last edition appearing in 1672. Pseudodoxia Epidemica found itself upon the bookshelves of many educated European readers for throughout the late 17th century and early 18th century it was translated, for many years it was not thought compatible with the French and Dutcheze, into the French, Dutch and German languages as well as Latin. John Harris is often credited with introducing the now-familiar alphabetic format in 1704 with his English Lexicon Technicum: Or, A Universal English Dictionary of Arts and Sciences: Explaining not only the Terms of Art, but the Arts Themselves – to give its full title. Organized alphabetically, its content does indeed contain explanation not merely of the terms used in the arts and sciences, but of the arts and sciences themselves. Sir Isaac Newton contributed his only published work on chemistry to the second volume of 1710. Its emphasis was on science—and conformably to the broad 18th-century understanding of the term 'science', its content extends beyond what would be called science or technology today, and includes topics from the humanities and fine arts, e.g. a substantial number from law, commerce, music, and heraldry. At about 1,200 pages, its scope can be considered as more that of an encyclopedic dictionary than a true encyclopedia. Harris himself considered it a dictionary; the work is one of the first technical dictionaries in any language. A French translation of Chambers' work inspired the Encyclopédie, perhaps the most famous early encyclopedia, notable for its scope, the quality of some contributions, and its political and cultural impact in the years leading up to the French revolution. The Encyclopédie was edited by Jean le Rond d'Alembert and Denis Diderot and published in 17 volumes of articles, issued from 1751 to 1765, and 11 volumes of illustrations, issued from 1762 to 1772. Five volumes of supplementary material and a two volume index, supervised by other editors, were issued from 1776 to 1780 by Charles Joseph Panckoucke. The Encyclopédie represented the essence of the French Enlightenment. The prospectus stated an ambitious goal: the Encyclopédie was to be a systematic analysis of the "order and interrelations of human knowledge." Diderot, in his Encyclopédie article of the same name, went further: "to collect all the knowledge that now lies scattered over the face of the earth, to make known its general structure to the men among we live, and to transmit it to those who will come after us," to make men not only wiser but also "more virtuous and more happy." Realizing the inherent problems with the model of knowledge he had created, Diderot's view of his own success in writing the Encyclopédie were far from ecstatic. Diderot envisioned the perfect encyclopedia as more than the sum of its parts. In his own article on the encyclopedia, Diderot also wrote, "Were an analytical dictionary of the sciences and arts nothing more than a methodical combination of their elements, I would still ask whom it behooves to fabricate good elements." Diderot viewed the ideal encyclopedia as an index of connections. He realized that all knowledge could never be amassed in just one large work, but he hoped the relations among the subjects could be. The Encyclopédie in turn inspired the venerable Encyclopædia Britannica, which had a modest beginning in Scotland: the first edition, issued between 1768 and 1771, had just three hastily completed volumes – A–B, C–L, and M–Z – with a total of 2,391 pages. By 1797, when the third edition was completed, it had been expanded to 18 volumes addressing a full range of topics, with articles contributed by a range of authorities on their subjects. The German-language Conversations-Lexikon was published at Leipzig from 1796 to 1808, in 6 volumes. Paralleling other 18th century encyclopedias, its scope was expanded beyond that of earlier publications, in an effort at comprehensiveness. It was, however, intended not for scholarly use but to provide results of research and discovery in a simple and popular form without extensive detail. This format, a contrast to the Encyclopædia Britannica, was widely imitated by later 19th century encyclopedias in Britain, the United States, France, Spain, Italy and other countries. Of the influential late-18th century and early-19th century encyclopedias, the Conversations-Lexikon is perhaps most similar in form to today's encyclopedias. The early years of the 19th century saw a flowering of encyclopedia publishing in the United Kingdom, Europe and America. In England Rees's Cyclopaedia (1802–1819) contains an enormous amount in information about the industrial and scientific revolutions of the time. 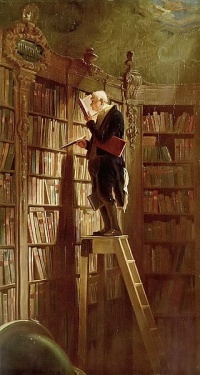 A feature of these publications is the high-quality illustrations made by engravers like Wilson Lowry of art work supplied by specialist draftsmen like John Farey, Jr. Encyclopaedias were published in Scotland, as a result of the Scottish Enlightenment, for education there was of a higher standard than in the rest of the United Kingdom. In the early 20th century, the Encyclopædia Britannica reached its eleventh edition, and inexpensive encyclopedias such as Harmsworth's Universal Encyclopaedia and Everyman's Encyclopaedia were common. During the 19th and early 20th century, many smaller or less developed languages saw their first encyclopedias, using French, German, and English role models. While encyclopedias in larger languages, having large markets that could support a large editorial staff, churned out new 20-volume works in a few years and new editions with brief intervals, such publication plans often spanned a decade or more in smaller languages. The first large encyclopedia in Russian, Brockhaus and Efron Encyclopedic Dictionary (86 volumes, 1890–1906), was a direct cooperation with the German Brockhaus. Without such a formal cooperation, the Swedish Conversations-lexicon (4 volumes, 1821–1826) was a translation of Brockhaus 2nd edition. The first encyclopedia written originally in Swedish was Svenskt konversationslexikon (4 volumes, 1845–1851) by Per Gustaf Berg. A more ambitious project was Nordisk familjebok, established in 1875 and intended to comprise 6 volumes. But in 1885, when it had published 8 volumes and gotten only halfways (A–K), the publisher turned to the government for extra funding; encyclopedias had become national monuments. It was finished in 1894 with 18 volumes, with two supplement volumes (1896–1899). The first major Danish encyclopedia was Salmonsens Konversationsleksikon (19 volumes, 1893–1911). In Norway, encyclopedias follow the unique history of the Norwegian language, the Bokmål variant having branched off from Danish during the 19th century. After the national independence in 1905, publisher Aschehoug (owned by William Martin Nygaard) hired librarian Haakon Nyhuus to edit Illustreret norsk konversationsleksikon (6 volumes, 1907–1913), in later editions known as Aschehougs konversasjonsleksikon. In the Nynorsk variant of the language, Norsk Allkunnebok (10 volumes, 1948–1966) was the only encyclopedia until the arrival of Wikipedia. The first major Finnish encyclopedia was Tietosanakirja (11 volumes, 1909–1922). Inspired by the minority language example of Norsk Allkunnebok, a Swedish-language encyclopedia of Finland was initiated in 1969 and eventually published as Uppslagsverket Finland (3 volumes, 1982–1985; 2nd edition in 5 volumes, 2003–2007). With such a small market, the sales revenue only covered the printing cost, while editors were paid by endowments. In 2009 the entire contents was made available online, free of charge. Already during czarist Russian rule, two editions appeared of the Latvian Konversācijas vārdnīca (2 volumes, 1891–1893; 4 volumes, 1906–1921). The larger Latviešu konversācijas vārdnīca (21 volumes, A–Tjepolo, 1927–1940) was interrupted by World War II and never completed. After the war, Latvian emigrants in Sweden published Latvju enciklopēdija (3 volumes, 1950–1956, with a supplement volume in 1962). Soviet authories published Latvijas PSR mazās enciklopēdijas (3 volumes, 1967–1970) and Latvijas padomju enciklopēdija (10 volumes, 1981–1988). Similarly, in the history of Lithuanian encyclopedias, the Lietuviškoji enciklopedija (9 volumes A–J, 1933–1941) was interrupted by World War II and never completed. Lithuanian emigrants in the United States published Lietuvių enciklopedija (35 volumes, 1953–1966). Soviet authorities published Mažoji lietuviškoji tarybinė enciklopedija (3 volumes, 1966–1971), Lietuviškoji tarybinė enciklopedija (12 volumes, 1976–1985), and Tarybų Lietuvos enciklopedija (4 volumes, 1985–1988). See also this list of historical encyclopedias. Popular and affordable encyclopaedias such as Harmsworth's Universal Encyclopaedia and the Children's Encyclopaedia appeared in the early 1920s. The second half of the 20th century also saw the publication of several encyclopedias that were notable for synthesizing important topics in specific fields, often by means of new works authored by significant researchers. Such encyclopedias included The Encyclopedia of Philosophy (first published in 1967 and now in its second edition), and Elsevier's Handbooks In Economics series. Encyclopedias of at least one volume in size exist for most if not all academic disciplines, including, typically, such narrow topics such as bioethics and African American history. By the late 20th century, encyclopedias were being published on CD-ROMs for use with personal computers. Microsoft's Encarta, launched in 1993, was a landmark example as it had no printed equivalent. Articles were supplemented with video and audio files as well as numerous high-quality images. After sixteen years, Microsoft discontinued the Encarta line of products in 2009. Traditional encyclopedias are written by a number of employed text writers, usually people with an academic degree, and distributed as proprietary content. Encyclopedias are essentially derivative from what has gone before, and particularly in the 19th century, copyright infringement was common among encyclopedia editors. However, modern encyclopedias are not merely larger compendia, including all that came before them. To make space for modern topics, valuable material of historic use regularly had to be discarded, at least before the advent of digital encyclopedias. Moreover, the opinions and world views of a particular generation can be observed in the encyclopedic writing of the time. For these reasons, old encyclopedias are a useful source of historical information, especially for a record of changes in science and technology. As of 2007, old encyclopedias whose copyright has expired, such as the 1911 edition of Britannica, are also the only free content English encyclopedias released in print form. However, works such as the Great Soviet Encyclopedia, which were created in the public domain, exist as free content encyclopedias in other languages. The concept of a new free encyclopedia began with the Interpedia proposal on Usenet in 1993, which outlined an Internet-based online encyclopedia to which anyone could submit content and that would be freely accessible. Early projects in this vein included Everything2 and Open Site. In 1999, Richard Stallman proposed the GNUPedia, an online encyclopedia which, similar to the GNU operating system, would be a "generic" resource. The concept was very similar to Interpedia, but more in line with Stallman's GNU philosophy. It was not until Nupedia and later Wikipedia that a stable free encyclopedia project was able to be established on the Internet. The English Wikipedia became the world's largest encyclopedia in 2004 at the 300,000 article stage and by late 2005, Wikipedia had produced over two million articles in more than 80 languages with content licensed under the copyleft GNU Free Documentation License. As of August 2009, Wikipedia had over 3 million articles in English and well over 10 million combined in over 250 languages. Wikipedia currently has 131,352 articles in English. Since 2003, other free encyclopedias like the Chinese-language Baidu Baike and Hudong, as well as English language encyclopedias like Citizendium and Knol have appeared. The encyclopedia's hierarchical structure and evolving nature is particularly adaptable to a digital formatTemplate:Disambiguation needed, and all major printed multi-subject encyclopedias had moved to this method of delivery by the end of the 20th century. Disk-based, typically DVD-ROM or CD-ROM format, publications have the advantage of being cheaply produced and easily portable. Additionally, they can include media which are impossible to store in the printed format, such as animations, audio and video. Hyperlinking between conceptually related items is also a significant benefit, although even Diderot's encyclopedia had cross-referencing. On-line encyclopedias offer the additional advantage of being dynamic: new information can be presented almost immediately, rather than waiting for the next release of a static format, as with a disk- or paper-based publication. Many printed encyclopedias traditionally published annual supplemental volumes ("yearbooks") to update events between editions, as a partial solution to the problem of staying up-to-date, but this of course required the reader to check both the main volumes and the supplemental volumes. Some disk-based encyclopedias offer subscription-based access to online updates, which are then integrated with the content already on the user's hard disk in a manner not possible with a printed encyclopedia. Information in a printed encyclopedia necessarily needs some form of hierarchical structure. Traditionally, the method employed is to present the information ordered alphabetically by the article title. However with the advent of dynamic electronic formats the need to impose a pre-determined structure is less necessary. Nonetheless, most electronic encyclopedias still offer a range of organizational strategies for the articles, such as by subject, area, or alphabetically. Digital encyclopedias also offer greater search abilities than printed versions. While the printed versions rely on indexes to assist in searching for topics, computer accessible versions allow searching through article text for keywords or phrases. The word "encyclopaedia" comes from mistaken Classical Greek "ἐγκύκλιος παιδεία", transliterated "enkyklios paideia"; "enkyklios" (ἐγκύκλιος), meaning "circular, recurrent, required regularly, general" and "paideia" (παιδεία), meaning "education". Together, the phrase literally translates as "common knowledge" or "general knowledge". Copyists of Latin manuscripts took this phrase to be a single Greek word, "enkuklopaedia", with the same meaning, and this spurious Greek word became the New Latin word "encyclopaedia", which in turn came into English. Though the notion of a compendium of knowledge dates back thousands of years, the term was first used in the title of a book in 1517 by Johannes Avenarius: Encyclopedia orbisque doctrinarum, hoc est omnium artium, scientiarum, ipsius philosophiae index ac divisio, and in 1541 by Joachimus Fortius Ringelbergius, Lucubrationes vel potius absolutissima kyklopaideia (Basel, 1541). The word encyclopaedia was first used as a noun in the title of his book by the Croatian encyclopedist Pavao Skalić in his Encyclopaedia seu orbis disciplinarum tam sacrarum quam prophanarum epistemon (Encyclopaedia, or Knowledge of the World of Disciplines, Basel, 1559). One of the oldest vernacular uses was by François Rabelais in his Pantagruel in 1532. Several encyclopedias have names that include the suffix -p(a)edia, e.g., Banglapedia (on matters relevant for Bengal). In British usage, the spellings encyclopedia and encyclopaedia are both current. Although the latter spelling is considered more "proper" by British speakers, the former is becoming increasingly common in British English, in part due to the spread of American English. In American usage, only the former is commonly used. The spelling encyclopædia—with the æ ligature—was frequently used in the 19th century and is increasingly rare, although it is retained in product titles such as Encyclopædia Britannica and others. The Oxford English Dictionary (1989) records encyclopædia and encyclopaedia as equal alternatives (in that order), and notes the æ would be obsolete except that it is preserved in works that have Latin titles. Webster's Third New International Dictionary (1997–2002) features encyclopedia as the main headword and encyclopaedia as a minor variant. In addition, cyclopedia and cyclopaedia are now rarely used shortened forms of the word originating in the 17th century. Unless indicated otherwise, the text in this article is either based on Wikipedia article "Encyclopedia" or another language Wikipedia page thereof used under the terms of the GNU Free Documentation License; or on original research by Jahsonic and friends. See Art and Popular Culture's copyright notice. This page was last modified 15:49, 15 April 2014.